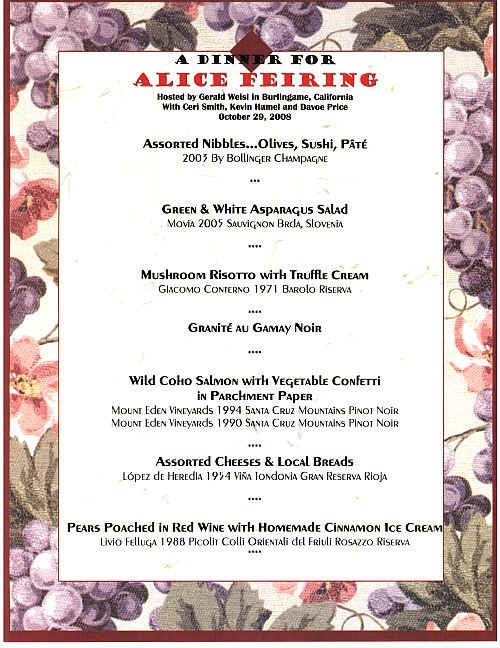 I've been a fan of Alice Feiring's for some time. 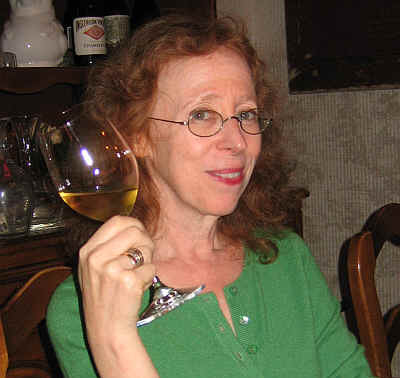 She writes a wonderfully opinionated blog and is a champion of "honest" wines...wines which offer diversity from vintage to vintage; wines which offer character and 'soul.' 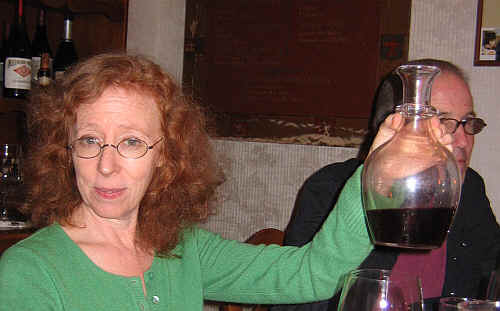 Alice is willing to challenge those who think wine appreciation can be distilled into a rather sterile numerical score. 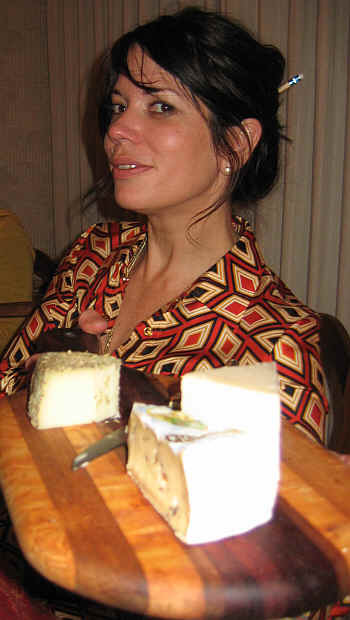 Knowing she was coming to the west coast for some research for her various writing projects (her blog, her New York Times blog, a blogger's conference and promoting her terrific book, "The Battle for Wine and Love or How I Saved The World from Parkerization), I extended and invitation for dinner. 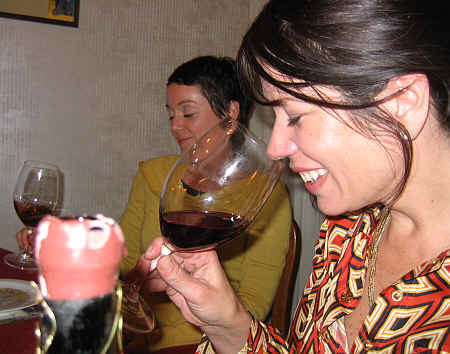 And so, following a "meet & greet" event at Biondivino in The City, Alice, winemaker Kevin Hamel (Hamel Wines, Pellegrini Family/Olivet Lane winery) and Ceri Smith (owner of Biondivino) trekked to Burlingame for vittles and vino. We were joined by wine broker/wine geek Davoe Price. 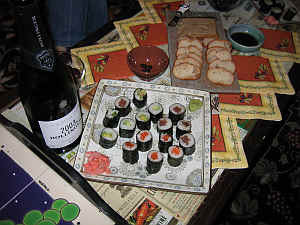 We began the festivities with a bottle of 2003 by Bollinger, a Champagne from a vintage of extremes. The Bollinger showed nice fruit more than their normal "biscuity" or toasty elements. It's not a bubbly of finesse, but was still very good. 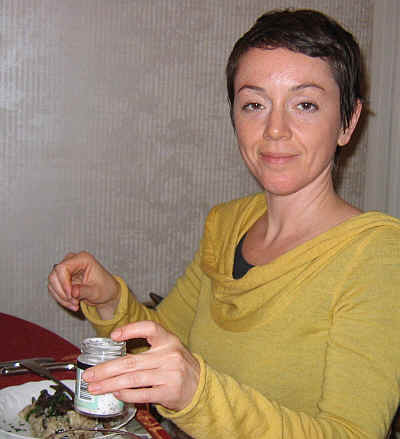 We then sat down at the dinner table and commenced with a salad. White and green asparagus, blanched, and served with some endive and baby lettuces. 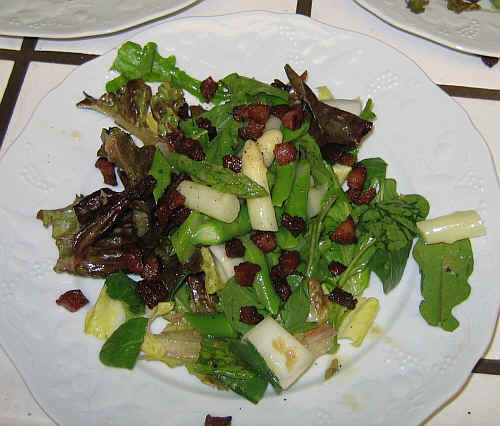 Four of the five salads was adorned with some pancetta. We opened a bottle of Movia Sauvignon, a famed producer in Slovenia. The Movia Sauvignon has a lovely fragrance hinting at vegetal/herbal/green. There's a streak of a stony element, too. It was delicious with the salad and a nice counterpoint to the slightly salty tang of the pancetta. 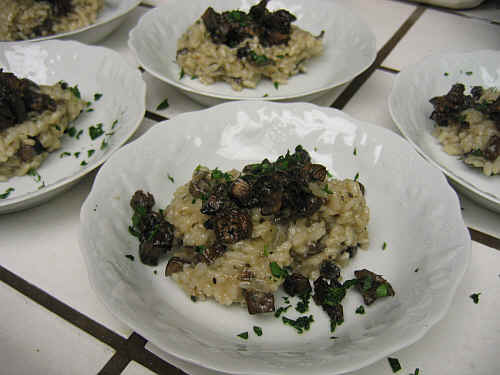 The second course was a risotto made with mushrooms: fresh Porcini, chanterelles and portabellas, along with some dried porcini and a bit of Porcini Mushroom Cream from Alba, Italy. I was impressed when Ceri remarked "Oh, I smell truffles!" as I was starting to plate the risotto. 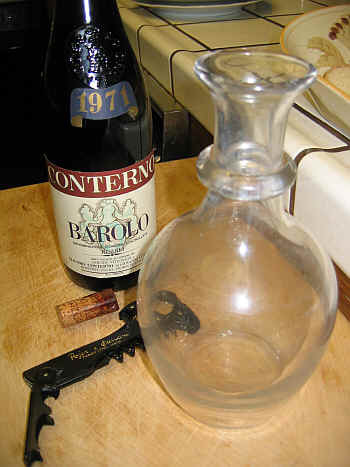 But first I had to decant an old bottle of Barolo. Carnaroli rice, by the way. 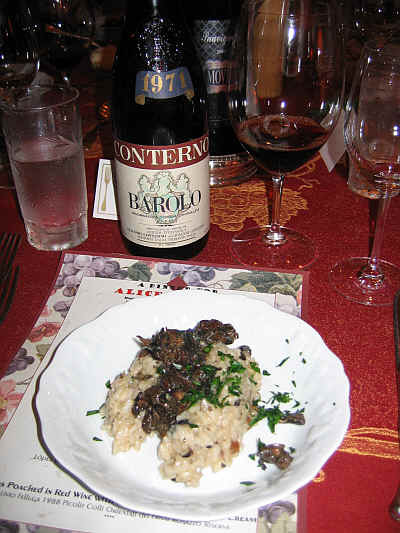 The Conterno Barolo was the wine of the night. This was a bottle given to me by Giovanni Conterno many years ago. 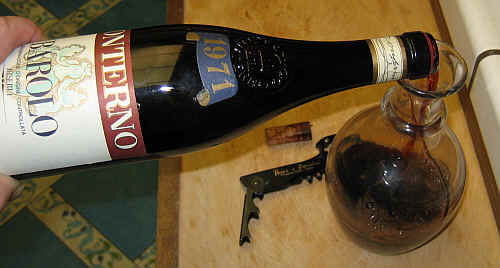 I had first visited the winery in the very early 1980s (and was offered a taste out of tank of the 1970 vintage Monfortino Barolo!) 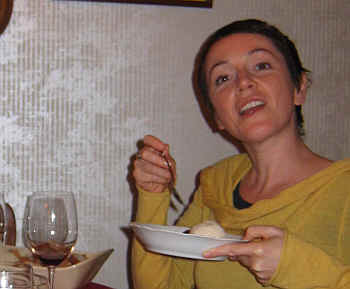 and would stop by when I was in the Langhe. 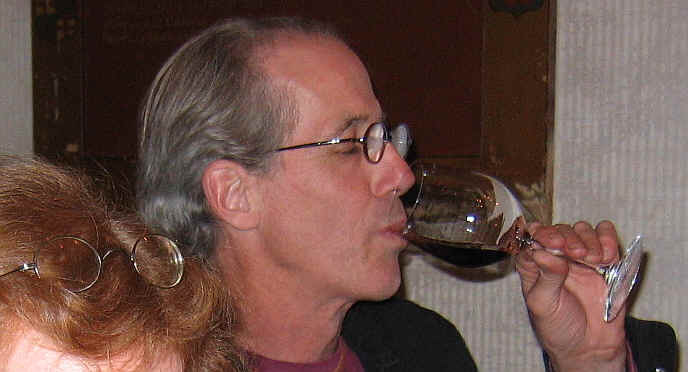 He was a delightful soul and I've long been a fan of his wines. Conterno's son Roberto continues in the grand tradition of his father, making classic Piemontese wines. Gilding the lily was the jar of truffle salt on the table. I don't add but a pinch of salt as I'm preparing the risotto and a few sprinkles of this truffle salt adds some vitality to the dish and balances it. 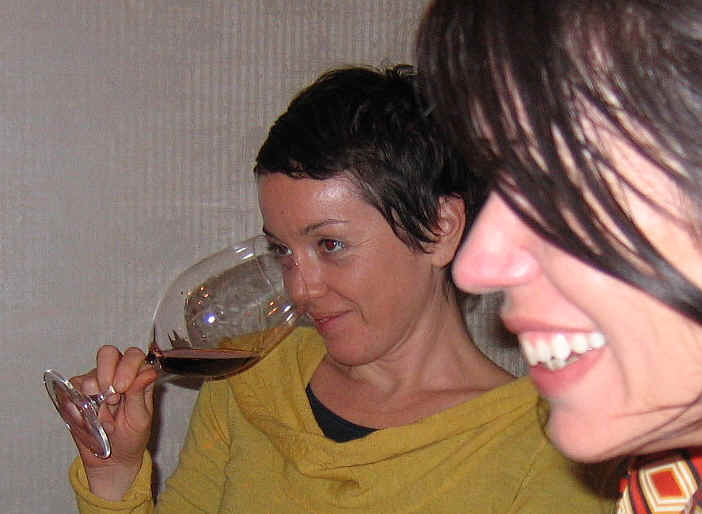 Ceri Smith keeps her eye on the wine. 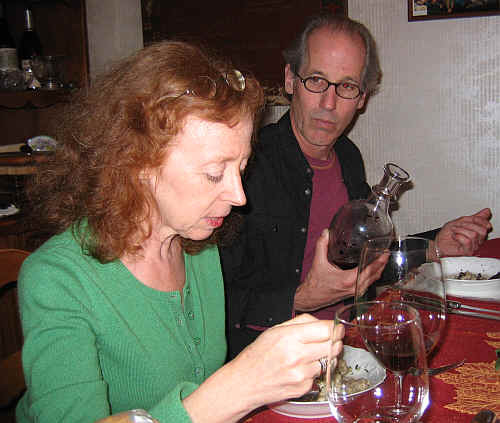 Alice and winemaker Kevin Hamel. To freshen the palate, we had a little intermezzo of an ice I prepared. 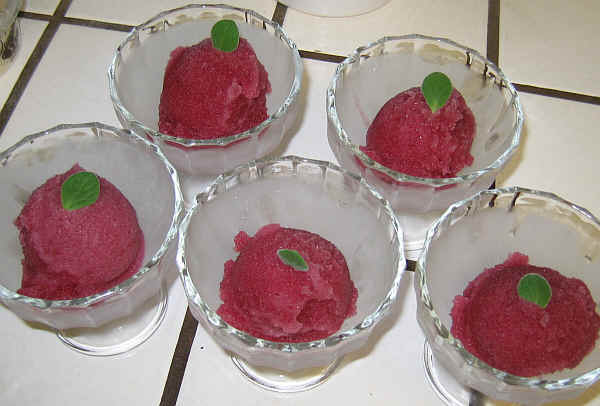 Alice had recently inquired if we had any Gamay wines in the shop, so I made the sorbet from an old vine Gamay from a little vineyard in Regnie owned by Jackie Gauthier. This is ridiculously simple and amazingly refreshing. 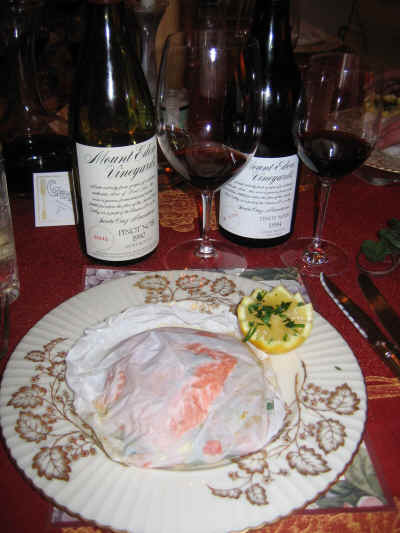 The main plate was salmon cooked in parchment paper on a bed of vegetable confetti: diced yellow and green zucchini, a red pepper, a green pepper and a Serrano chili pepper. For good measure, I tossed in a bit of saffron and some fresh thyme, too. We had two vintages of Mount Eden Vineyards Pinot Noir. This is a special wine from the Santa Cruz Mountains. The vines were originally planted by Martin Ray, who obtained budwood from Paul Masson. 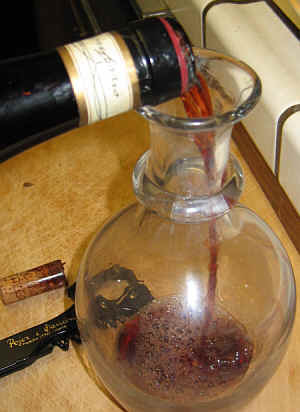 It's thought Masson got his cuttings from Louis Latour in Burgundy. We had the 1990 and 1994 vintages. 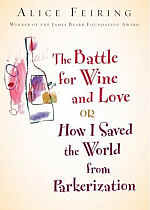 The 1990 was elegant, refined and leaning in the direction of Burgundy, while the 1994 was a riper, oak-dominated wine. 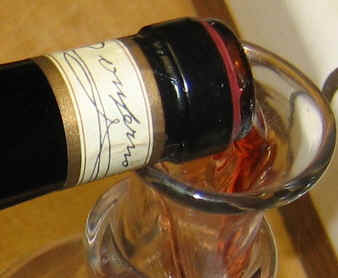 The 1990 danced rings around its sibling and both wines were vital and reasonably vibrant. What a delight to revisit these and to find the 1990 was as complex as it was. 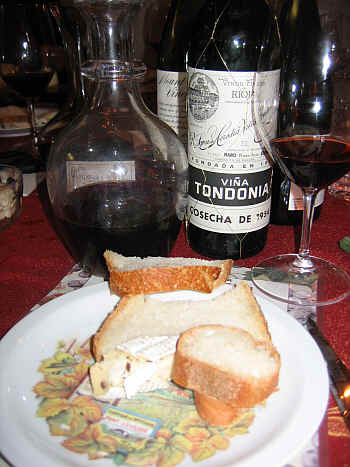 We then offered a few locally-produced cheeses and a couple of Spanish cheeses to pair with an old, dusty bottle of Rioja. R. L�pez de Heredia 1954 Vi�a Tondonia. The wine is nicely acidic and mildly tannic (still)...and there's an elegance or refinement which is remarkable. 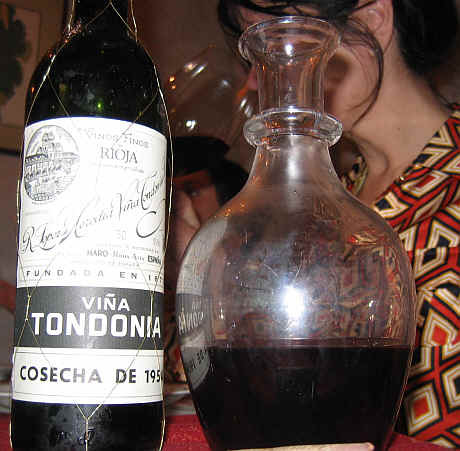 Alice has an entire chapter on Spain and the L�pez de Heredia wines in her book, so opening a bottle of wine from such a venerable vintage was a delight and a nice touch of history. A couple of 1954s and a 1955. We then proceeded to something "completely different," dessert. 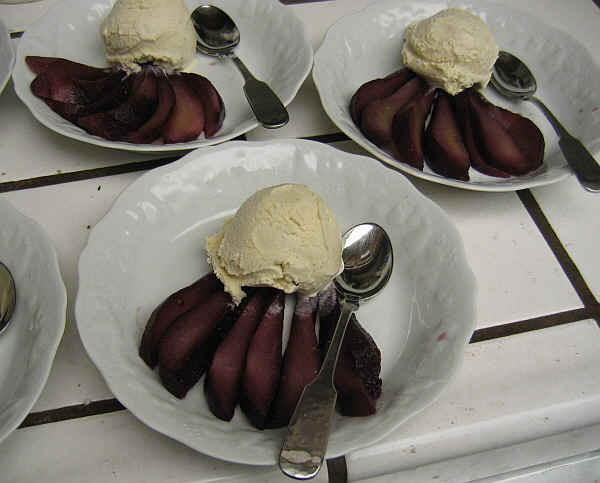 Pears poached in Syrah with a dash of cinnamon accompanied by a homemade vanilla ice cream infused, also, with cinnamon. 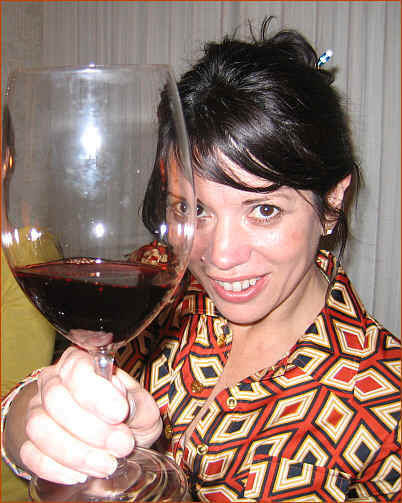 Years ago Elda Felluga gave me a bottle of her family's 1988 Picolit. 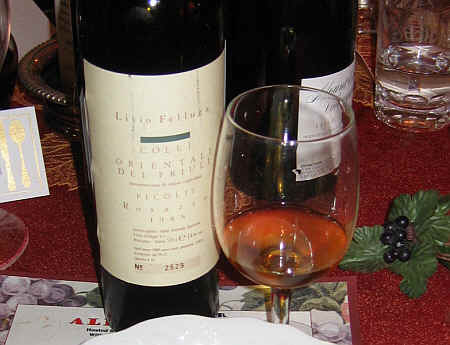 This is a rare sweet wine from Friuli. The vine doesn't set a large crop and the fruit is picked late in the season. I believe they dry at least a portion of the fruit to further enhance the resulting wine. This wine was golden/amber in color. Notes of dried figs, raisins and hints of orange peel came through nicely on the nose and palate. We had spent a glorious evening (and now, part of the morning) at the dinner table with much eno-banter and conviviality. 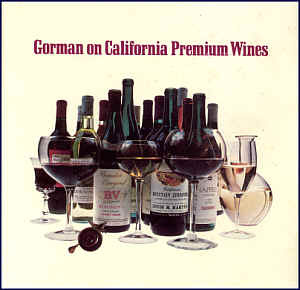 We sent Alice home with a copy of Bob Gorman's book, a superb snapshot of the California wine scene before spoofulation was so common.